The bipartisan PAC has completed its probe into 1MDB. It found no wrongdoing. It discovered no crime. What it found after over a year's painstakingly thorough proceedings are weaknesses at management as well as Board level. Arul Kanda, who was brought in last year to salvage the fund, has also done his job: the rationalisation plan leaves 1MDB in good stead. But there's no rest for the man, yet. Tonight, he appeared on RTM to answer all remaining questions on 1MDB, including IPIC and Aabar. 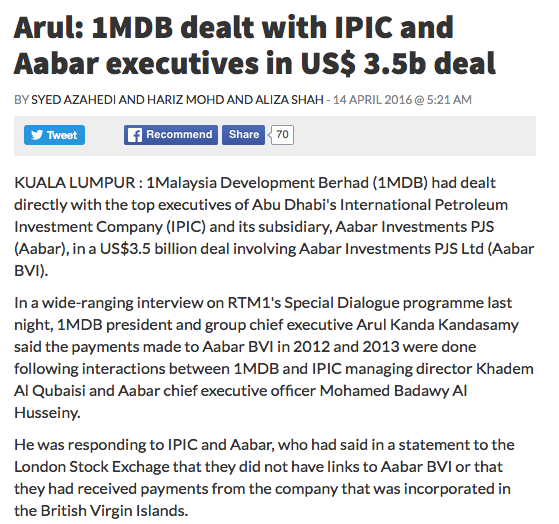 Arul disclosed for the first time that 1MDB dealt directly with IPIC managing director Khadem al Qubaisi and made payments as per the Aabar instruction. 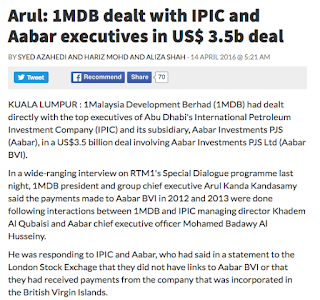 For IPIC/Aabar to say they are not aware of it now, in Arul's own words, suspicious. Watch and learn. No wonder Tony Pua and Rafizi Ramli dislike this Arul. Beautiful answer by Arul Kanda.. Yes, it seems Tony Pua does not like Arul. I too do not like Arul. Rafizi ? He may because he was hoping that Arul comes along with him in the same cell. What's the problem with Arul ? He is not good in bluffing and worse, he makes Najib look so bad ! Hey, why am I complaining ?? How come very easy he can get RTM prime time slot just to "clean" him self up and the PM ? Did he dare to debate Tony Pua rather than barking to be innocent ? "It found no wrongdoing." Wow, your England is truly screwed. It found plenty of wrongdoing, but so far, the evidence trail is incomplete because 1MDB did not cooperate in giving documents, especially foreign bank statements. Plus wiring instructions to overseas accounts. Are you waiting for a foreign country to "request" for an interview with your boss before you sing a different tune ? 90% think that your boss is guilty and you still try to defend him ? For what, Locky ? For the datukship, everything that is commonsense can be thrown out of the window ? The fact remains that inspite of the hue and cry of the opposition, there is no evidence of a prosecutable or punishable offence committed by anyone connected or concerned with 1 MDB to the extent claimed or alluded to by the opposition. A loud chorus does not a choir make. The sme responses apply to the money alleged to hav been found in the Prime Ministers personal account if it was indeed the case. Trawling the constitution of Malaysia and various laws including the criminal laws of Malaysia and there appears to be no connection to whats reported about the Prime Minister, his personal account and the money allegedly placed in his account in any of the laws. There is nothing in the common law, statute or valuable case law that in any regards supports a cause of action against the prime minister in this regard. Whats impeachable in all of this is the conduct of members of the Malaysian Bar, it impugns their integrity as legal practitioners and as members of an organization whose motto is "without fear or favour". What comes out of the Malaysian Bar's conduct throughout this entire episode is that the work in fear of the truth, in fear of their incompetence being discovered and that they seek the favour of those who seek to destabilize the country. You know, Locky, you read the comments of your readers, and practically no one is buying the official story. Why do you persist with peddling the lies of these crooks ? Bloggers najib dengar nya tengah bercakaran. Sebab nya? Sebab apa lagi klu tak wang? With umno folk mesti lah sebab wang. Cerita nya ko pun hebat. What I don't understand is the lack of a sense of outrage over the BVI payment on the part of our leaders, from pm to ministers to component party leaders. Isn't that a lot of money? It doesn't raise you ire? Now kanda says 1mdb kena tipu. Other than that.... No response. Wow so cool. Maybe same reasoning that was offered by the kwap boss. Not worried cause loan guaranteed by gomen. Same logic as i-sign-but-it- doesnt- mean- i- know- what- i'm- signing as offered by the cerdik nazri and the premier lawyer. I guess semua boleh jadi cool sebab bukan sign away duit bapa masing2. And how to expect trust from rakyat. Move on? Huh? He is cleverly beaten by Arul in two important aspects, corporate matters and PRO. The faster he can admit defeats, the more chances he will get to make a complete recovery.